Language matters, and in fact the vocabulary we use can shape a conversation, defining what we talk about. I see this happening among those of my fellow evangelicals who advocate for nonviolence, both in how we understand faithfulness to the way of Jesus and the character and way of God revealed in Christ. While I share this commitment to nonviolence as an essential part of Christian discipleship, I would like to propose that the term “nonviolence” itself is restricting the pursuit of this goal and causing us to get stuck. I want to propose instead that we need to learn to speak of peacemaking. For many evangelicals, when they speak of their commitment to nonviolence as well as their understanding of God’s nonviolence, this is understood primarily in terms of something you abstain from; it is a commitment to not do something; it is a prohibition. Some examples of this would be Greg Boyd, Preston Sprinkle, and perhaps to a lesser extent my buddy Brian Zahnd. This is a position that has a lot of weight behind it. The early followers of Jesus (for the first few centuries, pre-Constantine) were in fact known for refusing to defend their lives with violence, and associated this with faithfulness to Jesus. That’s the whole idea of being a martyr for Jesus. Let me be clear that I do not disagree with this commitment, and in fact share this commitment to abstaining from violence personally. I also fully appreciate the merits of the position, both in terms of the New Testament witness and the witness of the martyrs. In fact, my intent is not to critique or disagree with this position, but rather my aim is to help it. I observe that this particular approach -- which is a position which I have often found myself seeking to defend -- has unwittingly resulted in getting us stuck, and I’d like to propose a way to get us unstuck. To do that, I’d like to change the conversation from a focus on saying what we will not do, and move towards saying what we will do. If we say that we will not use violence as a means to bring about justice, then how do we propose that justice should be brought about? If we will not use violence as a means to bring about peace and safety, then how do we propose to do that? Simply focusing on what we abstain from does not address these important questions. So I want to propose that instead of speaking about non-violence (in terms of a non action, a prohibition, a thing we don’t do) we instead speak of peace-making which implies concrete action, making peace. A corollary to this are the endless biblical debates as to whether or not Jesus and/or the New Testament ever endorses violence. What about those two swords? What about that one thing Jesus said? Notice again that the focus is again on whether violence is ever justified. The dynamic I see happening here is that there is a concern that if a person committed to non-violence admits that in these extreme cases violence would be justified, or admits that Jesus just might endorse violence in some cases, this will lead to a slippery slope where more and more violence is justified, until eventually just about any violence is justified. Unfortunately, I think this concern is well founded. There is a strong narrative, particularly in the USA, that lethal violence is not a last resort but more and more it is the first and only resort. We not only see violence being justified, both in movies as well as from conservative preachers, we see it being glorified by them. Violence is portrayed as holy, noble, patriotic, heroic... to the point that it is beyond question. The slippery slope fear is real. So in reaction people will double-down in a teetotalling sort of way, insisting that violence is never justified. 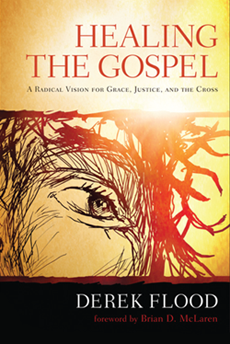 Often here an authoritarian appeal is made to Scripture. Jesus clearly forbids it, it is argued, so it doesn’t matter whether nonviolence is an effective means of bringing about good or not, violence is just forbidden, period. So we have this dynamic where each side gets more and more extreme. I think the way to get out of it is to change the question. Instead of asking “is violence ever justified?” we should instead ask “what can we do here to reduce violence?” Consider that if I myself refuse to commit violence, that does not in itself do anything to reduce violence in my community or world. So if I want to have less domestic violence, less mass shootings, less terrorism, and so on, what can we do to move towards that? That’s the question we need to be asking. In regards to the question of whether violence is ever justified, I will take the middle ground and say yes, it is in some cases. I think for instance that the police officer who shoots an active shooter on a rampage is doing the best thing in that situation. In fact, I’m frankly glad they do it, and I do not feel any moral conflict for saying so. Saying that however does not in any way stop me from wanting to find ways to reduce violence in my country and world, including working to reform the systemic problems that lead to police shooting unarmed people of color. I’m glad we have police to protect us in situations like mass shootings, but those police officers are just fallible humans like me, and are just as susceptible to bias as any of us are. They therefore need to be educated in tools of conflict resolution and trained how to deescalate dangerous situations. They need to work to develop positive relationships of mutual trust and respect with the communities they serve. Because of this lack of training we not only have people not wanting to call 911 for a domestic dispute for fear that their spouse will be shot, we also have police officers in more danger because they only know how to escalate, rather than deescalate dangerous situations. So I want to get away from this hero bravado and recognize that these are just humans with a difficult job, which I am grateful for. They need to be provided with the training and tools to do that job the best way possible. Notice that the position I am advocating is messy and imperfect. That's hard to take for those of us who come from the evangelical focus on being "100% sold out for Jesus" and who yearn for perfection and purity in our lives. It is not the story of "before I was bad, but now I've seen the light and am completely healed and free!" I'm sure the idealistic teen version of myself would not have liked this. I would have seen it as compromising, selling out. I love my teen self, but I'd hope that he would learn as he grows and matures that if we insist on perfection or nothing, we usually end up getting nothing. That does not mean as an adult that I have given up on the goal, but it does mean that I recognize that it takes lots of little imperfect steps to get closer to that goal. So I hope I can act to make a world that is a little less violent today than it was yesterday, and continue working to make it even less violent tomorrow. It's a slow march towards justice and love. I think we can find a useful parallel to the issue of violence in looking at divorce. One could easily take Jesus’ words to say that divorce is categorically forbidden. On a low moral level we ask questions of permission and prohibition. So the question here becomes, “Am I allowed to get a divorce or not?” But the deeper and more important question to ask is “What do we need to do to have a good and healthy marriage?” and more specifically “How can we break out of our patterns of hurt and conflict, and restore trust, and the joy, surprise, and closeness in our relationship again?” After all, I think we can also all agree that no one likes divorce. It’s a painful and tragic experience. So the goal is to see if it is possible to help marriages to be restored. This is an approach that is not naive or idealistic, but very aware that our human experience is one of imperfection and struggle. It begins right in the middle of that and seeks to move us towards love. I know a thing or two about this specific issue because my wife is a licensed psychotherapist specializing in marriage counseling. As a couples counselor she would agree that in some situations divorce is the best option. However, part of her job is to help people to heal their marriages, getting past wounds and hurts, in order to avoid divorce whenever possible. That doesn’t mean staying in an unhealthy marriage, it means working to make the marriage healthy and loving. Similarly with violence, if the question is “can it ever be justified” I will answer: Yes, it can. So can divorce. So we can stop with all those hypothetical what-if scenarios, and we can stop with all the unproductive biblical arguments about Jesus and swords. Let’s move beyond that, and instead all agree that even if divorce and violence can both be justified, we’d all nevertheless like to live in a world with less divorce and with less violence. Not only that, we’d all like to live in a world with happy loving marriages, and with people living in security and freedom. In order to get to that, the kinds of questions we need to be asking are therefore: How can we work to mend broken relationships? How can we work to resolve conflict? How can we work to bring about social justice? How can we promote safety? How can we reduce harm? How can we become ministers of reconciliation and peacemakers in the world? 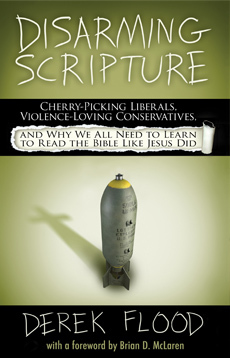 I think changing the question from “is violence ever justified?” to “how can we reduce harm and work for good?” offers us a way to break out of these spirals of biblical debates and hypothetical scenarios, as well as to avoid painting ourselves into a corner of an extreme position of teetotalling nonviolence backed by authoritarian appeals to Scripture. Instead of going in circles or getting stuck we can move towards working for peace and justice and love—working to reduce harm by promoting the way of Jesus and the four “R”s of the gospel: reconciliation, redemption, reform, restoration. This is a really helpful reframing, Derek. Thanks.